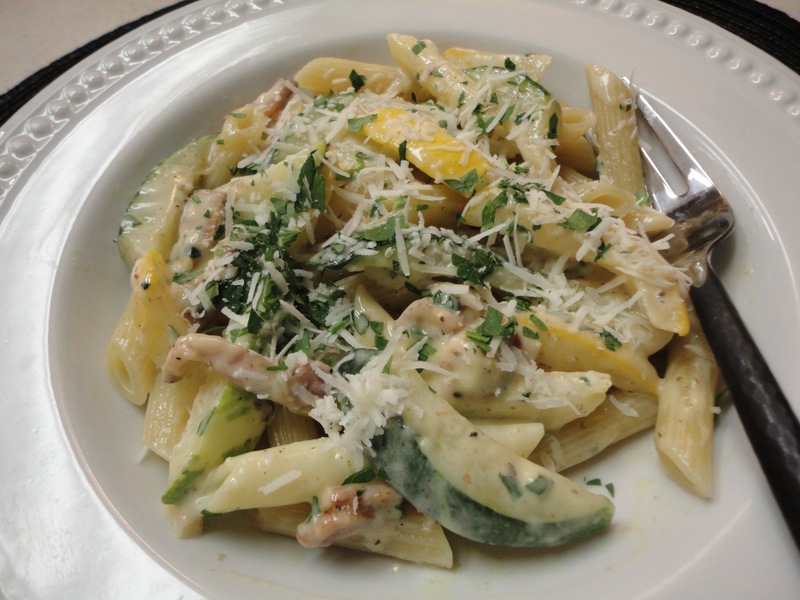 Zucchini and Pasta Together Are Winners! Zucchini is an underrated vegetable. 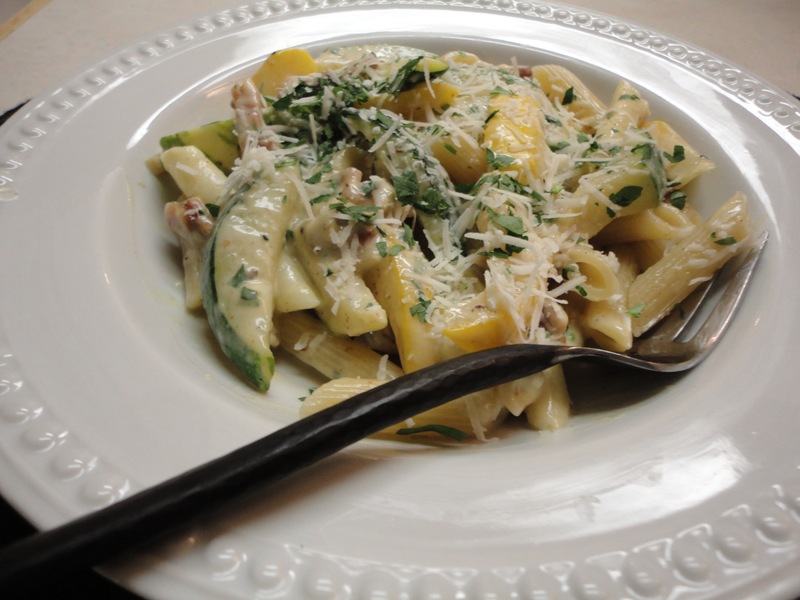 We have never been great lovers of this particular summer squash but this year something changed. We learned to understand Zucchini and we have now come to love it. There a time in summer when zucchini just goes crazy and we were exposed to a lot of it. we tried it in our Summer Ratatouille, we made stuffed Zucchini flowers which were sublime and we let it star in our Zucchini Carbonara! This was our first attempt at this luxurious dish and it was a hit! We invited our Cottage neighbor Donna to join us as the guinea-pig for this new recipe and she loved it. So here goes! Cook’s Tip: Carbonara is a simple enough dish to prepare if you understand that you are making a sauce from raw eggs and cream. The secret is to remove the pan from the heat once the pasta and veg are ready. This way the eggs will not scramble and the sauce will be rich and creamy. Too much heat will simply scramble the eggs ruining the texture of the dish. 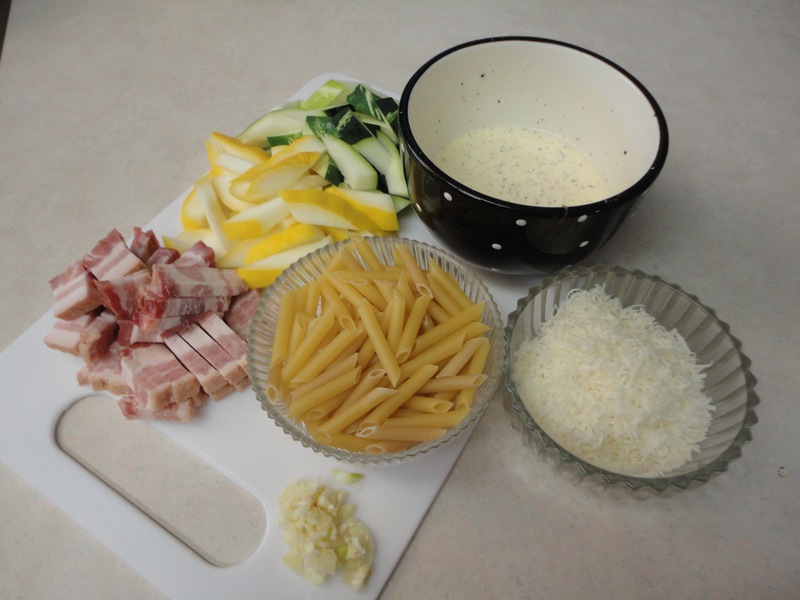 The pasta water is added to loosen the sauce so it is light not thick. a bit of reserved pasta water, about 1/2- 3/4 cup. Minced Italian Parsley and more grated Parmesan for garnish. Begin by cutting up the zucchini and bacon. Mix the egg yolks, cream, grated Parmesan and pepper in a small mixing bowl. Set aside. Heat the water in a large pot for the Pasta and start frying the bacon lightly in a skillet. You will need to watch the timing on this dish just a little. As the bacon becomes lightly browned, toss in the Zucchini and garlic. Stir fry the Zucchini but just till it softens a little. DO NOT OVER COOK the zucchini. The moment the pasta is al Dente, drain it and reserve 1 cup of the cooking water. Put the pasta in the skillet and remove the skillet from the heat. Pour in the egg and cream mixture. And just enough of the pasta water to create a silky sauce. Serve with chopped parsley and grated Parmesan. Bellissimo!